We are extremely proud to announce that BCP has just been awarded FAST’s Business Excellence Award for Broker of the Year and Commercial Broker of the Year in VIC and TAS for 2018! 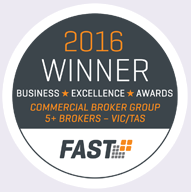 Through the nomination and receiving of these awards, the FAST Group have recognised BCP Finance as a high achieving, customer-focused Australian broker. The 2018 FAST Business Excellence Awards were held recently in Byron Bay, where Australia’s best brokers came together to celebrate industry professionals and their achievements. Industry awards are a fantastic way to acknowledge a business’ hard work, dedication to their craft and exceptional service, all values which we continually strive to uphold as a team. We are delighted to be consistently recognised as competitive brokers within the industry and always work to provide the best possible experience for each of our clients. We are extremely grateful to be nominated alongside such highly regarded firms and are incredibly proud of our team for their efforts and contributions toward making BCP a nationally acclaimed broker in Australia. At BCP, we have established a strong company culture that thrives on assisting families, companies and businesses of all sizes to buy their first home, open a business, undertake a development and more. After over 20 years in the industry, we understand the hardships of establishing and maintaining financial relationships and aim to assist our clients in every way possible during this process in order to make their dreams and desires reality.